Looks awesome, though. A lot better than anything else I've seen for the iOS so far. Wow, the reviews and this trailer have pretty much convinced me I need this game. World War III has been fought to the tipping point and ecologists long unheeded cries have been silenced by the grim truth of their predictions. To the last drop of oil have the worlds resources been depleted, and only sporadic traces of modern structure can be sifted in the dust. Time ticks forward, but humans must retrace their advancement back, through a history that has already been lived and to the Wild West for the second time. We have trampled ahead to the past in muddy boots, to the United States of late 19th century. - Welcome to the world of Warm Gun, the 2nd coming of the Wild West. A post-apocalyptic romp through the ravaged "Divided States of America". 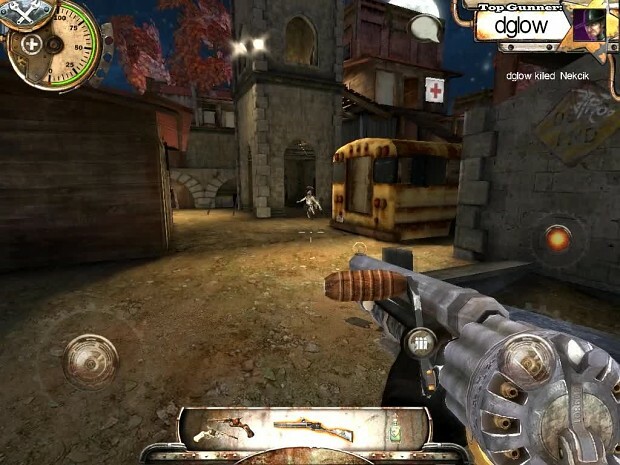 - Warm Gun iOS is a free form FPS (this game ain't got no rails!) where you the player, must fight for survival! Easy to Learn, Hard to Master... Do you have what it takes?